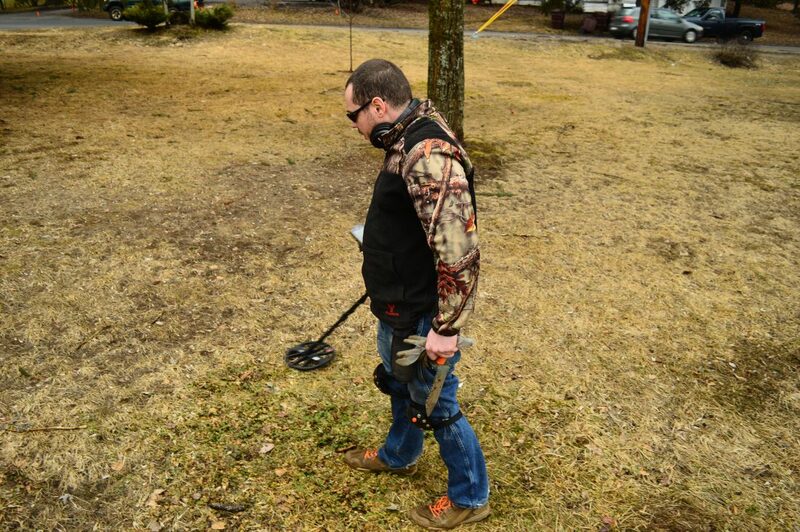 SARANAC LAKE — Stephen Krupka’s metal detector beeped and wailed as he passed it over the soft ground Tuesday afternoon. “Looks like we’ve got a nickel signal here,” he said. Kneeling down, he took out a serrated hand trowel and cut a plug of grass from Denny Park on the corner of Pine Street and Bloomingdale Avenue. He dug around for a second and pulled out two chunks of dirt-encrusted metal. It wasn’t anything valuable, but it provided an interesting glimpse into the past. More on that later. This was Krupka’s first treasure-finding trip of the season. 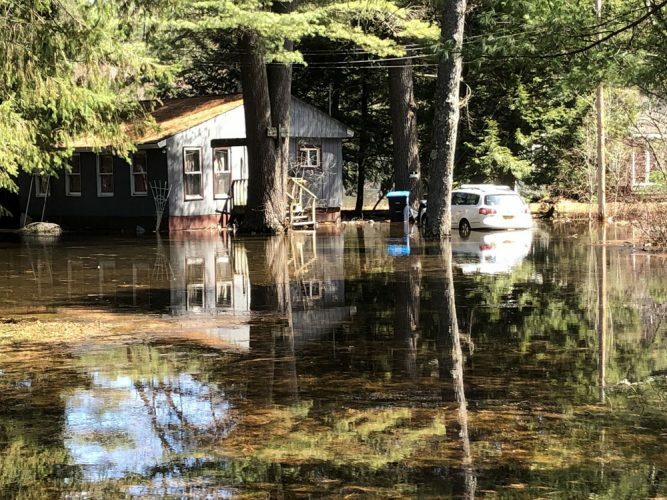 On the bank of the Saranac River on the edge of town, the snow had melted and the day-an-a-half of rain made the ground a breeze to cut into. 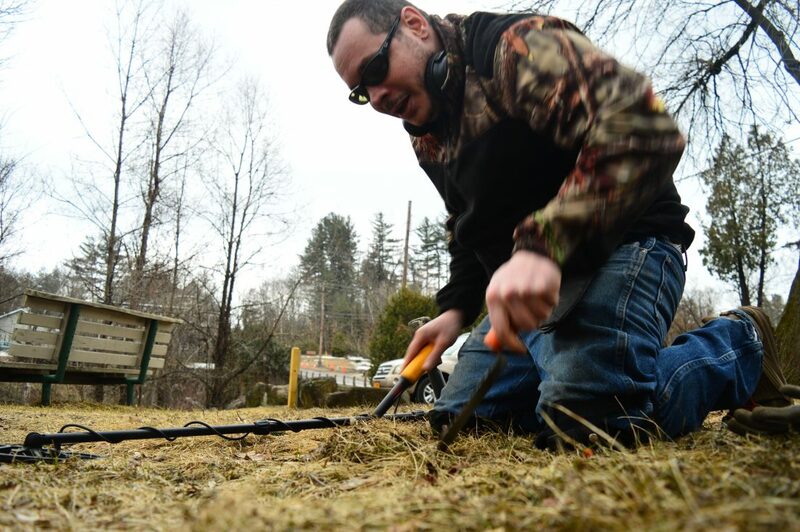 Krupka, a Saranac Laker, has been metal detecting as a hobby for three years, but got into it as a child, digging up valuables with his step-father, whom he said made a good deal of money doing it. Krupka isn’t trying to get rich, he just enjoys the activity of seeking out historic ground and unearthing hidden relics. He picks up trash on the way and uses the trinkets he finds, like hood ornaments or toy cars from the 1930s for decorations. 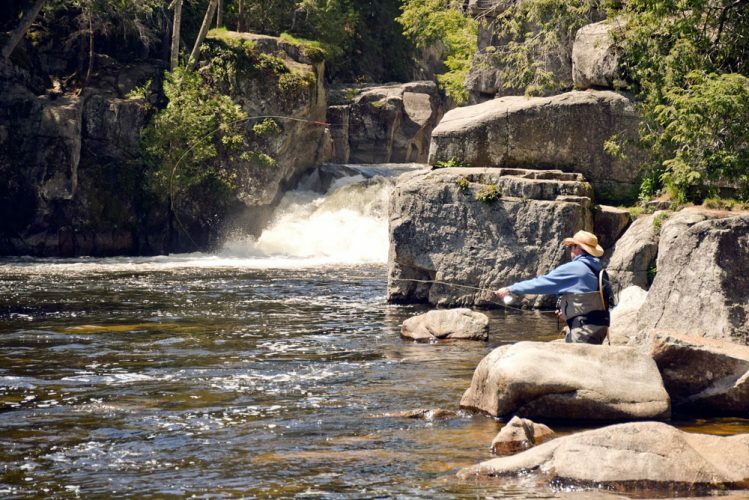 He said while the hobby is popular in the southern states, there is not much of a metal detecting community in the North Country. 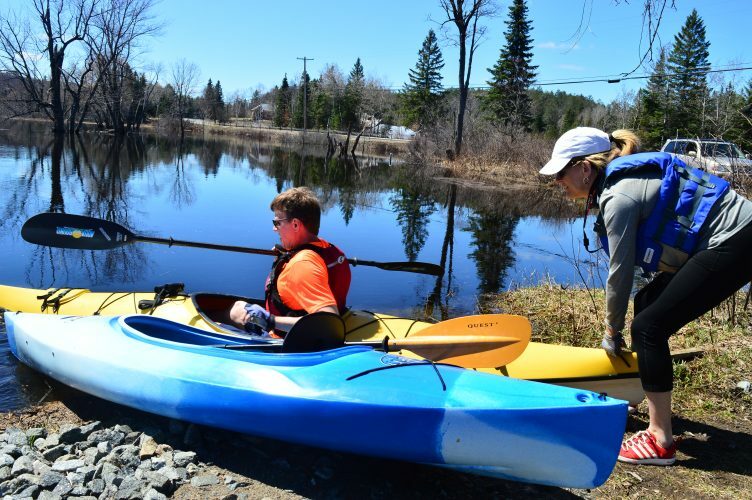 “It should be a lot bigger, especially with some of the historic sites that we have,” Krupka said. 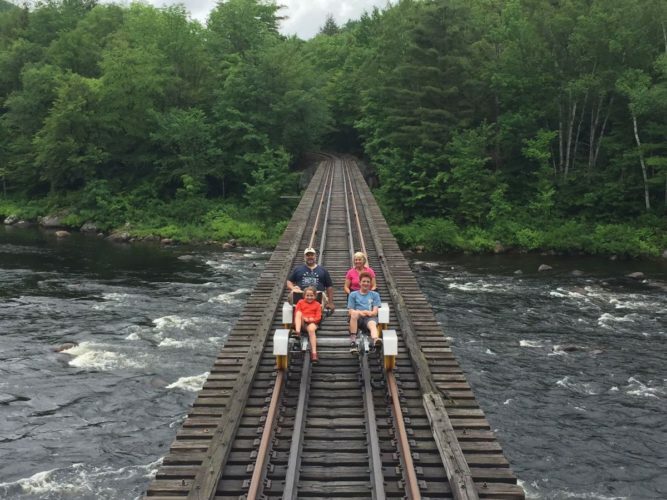 He’s been around to abandoned churches in Lake Clear, tuberculosis houses in Saranac Lake and even active Olympic fixtures in Lake Placid with his gear, finding Indian Head pennies, buttons from the 1700s and 1800s, and rings. From toonies to toothpaste, he said a lot of treasures and trash can be found in town. Krupka said he has to inform the police when he will be exploring abandoned tuberculosis houses, though. He researches historic areas on the internet, mapping out good places to hit by learning the history of the sites and calculating how populated they may have been. This day, he had found a Canadian penny, which the country stopped circulating in 2012, and two metal chunks. A moment of anticipation stretched longer and longer as he cleaned them off, turned them over and began to unravel one of them. “You know what? There’s even writing here,” he said. He had also found a metal toothpaste tube of Colgate’s Ribbon Dental Cream. Colgate was actually the first major company to sell toothpaste in a tube, starting in 1896. Over the years, the tubes have been made from a variety of metals, starting with lead. They then mostly used tin and aluminum until metal shortages during World War II led to using a mix of plastic and metal. In the 1990s, all-plastic toothpaste tubes were introduced and metal tubes went out of style. Krupka found the tube around 6 inches below the surface, and he said he has found metal up to a foot deep in the ground. A low-end detector can cost $250, he said, and still find things. Five-hundred dollars will get a mid-range one. He said he spent around $1,000 on his. He said the more spent on one, the deeper and clearer the signal will be. Metal detectors work by emitting a magnetic current. When the device detects metal, it induces “eddy currents,” which create magnetic fields of their own. Different types and sizes of metal produce different tones when detected by the device, he said. 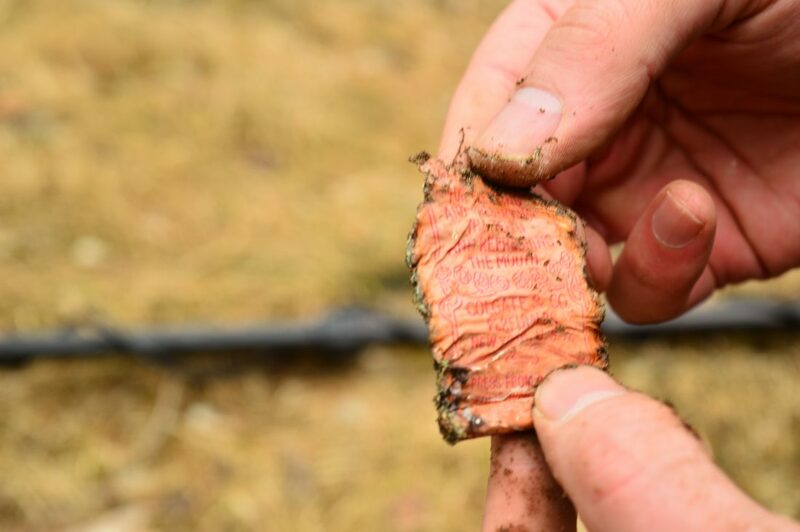 Krupka said when the ground is wet it is more conductive and the magnetic fields can travel further. His detector scans at several frequencies at once, too. “There’s quite a few tools of the trade that you would definitely want if you were getting into it, but it’s nothing too majorly expensive,” Krupka said. This kind of hobby can pay for itself over time, too. He doesn’t anticipate that he will, but he has sold some of his finds on the internet. For him, he said the fun comes from the thrill of the chase and the history he digs up.